Having driven past this summit many times (on the way to bigger and better ones?) I thought it was about time to tackle it and get both a unique and complete. The WX was looking very good plus there were a few other activators headin out so the plan was for a long activation, trying multiple bands and not rushing around as I usually end up doing! From my home QTH in East Brighton, it was a 90 minute drive through the eastern suburbs into the Yarra Valley towards Warburton. The traffic was still light at just after 8:00 am but the Warburton Hwy can be slow going with the speed restrictions and being mostly a single lane. 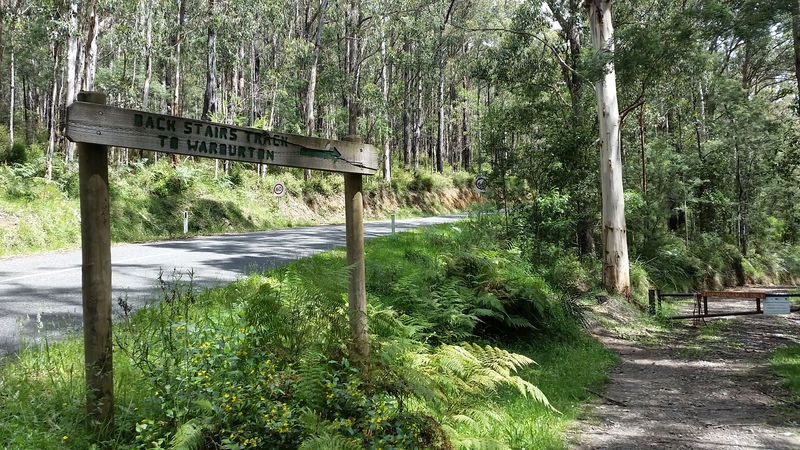 I planned to access the summit via the southern route so I took the Old Warburton Hwy turn off prior to Wesburn and parked in a clearing opposite the signposted Back Stairs Track to Warburton. The walk starts from this Fire Management road that is also listed as being seasonally closed but I have my doubts of the Road (Possibly known as Little Joe Track) being open to the public for vehicle access. That said, there were definite signs of trail bike use and also mountain bikes. Passing around the locked gate and with the Back Stairs walking track disappearing down to the right, you continue along the fire management road to where the road does a sharp right bend at the Back Stairs Creek bridge. It is quite boggy here even with the deposits of road ballast. A short and gentle up hill climb is then undertaken until a distinctive trail is located on the left. This trail at first does not look like a 4×4 track but opens up a bit once around the corner. 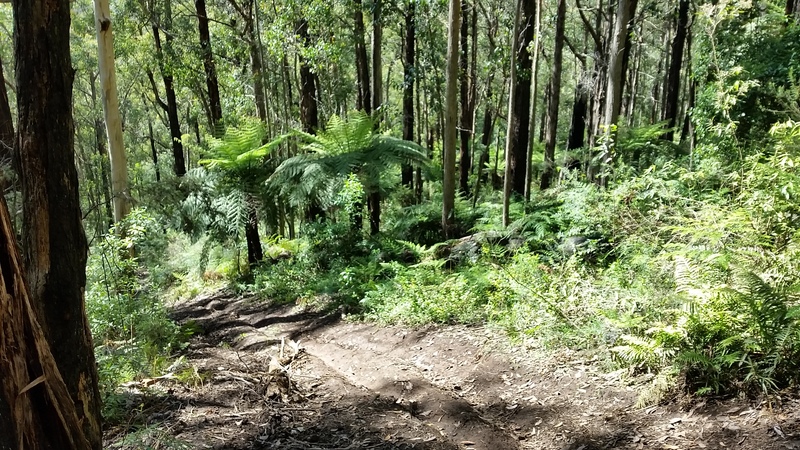 This trail is quite steep and being clay based, very slippery and climbs at a steady pace until a formed 4×4 track is reached. My guess the trail was formed by vehicles looking for a way down to the fire management road as it appears the formed road to the summit (a continuation of Hooks Rd perhaps?) has been deliberately bulldozed closed at this junction where it can be seen a clearing of sorts down hill to the east. Anyway, once on the formed 4×4 trail, the going is quite easy going to the summit. Carpark is at approximately 320 metres and the summit is at 516 metres. The steep and slippery climb is from about 350 metres to 470 metres. All up, it took 37 minutes to reach the summit from the car is reasonable conditions. Activation time 3 hours and 15 minutes. Bands worked: 80, 40, 30, 15, 10, 6 & 2 metres. Calls made on 20 metres without result. I took my time to set up and tried to orient my doublet antenna for best propagation to the north east and south west. This was not that simple as the 4×4 trail ran in a similar direction; a compromise was required. Scouting over the bands, I found Paul VK5PAS/P in VKFF0830 so worked him on 40 metres phone before going down the band to CW. The going was dreadfully slow, even after getting a spot out with only 1 CW contact with VK2MWP. Seeing Marc VK3OHM/P was on Mt. Macedon, I quickly reverted to SSB for a S2S then tried 15 metres CW where I began a contact with Ron VK3AFW just prior to UTC rollover. Slow going alright, just 4 contacts in 23 minutes! 2 more 40 metre SSB contacts with VK3OHM/P and VK1VIC/P then 2 further CW contacts with VK7CW and VK2GAZ. I then tried 80 metres CW and worked Warren VK3BYD and Peter VK3PF both with reasonable signals albeit some QSB. I worked locals VK3AFW and VK3BY on 10 metres CW plus other locals on 6 metres SSB. Moving down to 40 metres SSB again for S2s with VK1FAJW/2 and VK1DA/2 and VK3HN/P before finally closing down HF operations and having a short burst on 2 metres SSB with solid signals into Melbourne and Geelong. The walk down was a bit quicker and certainly easier than that of the way up. The slippery terrain was such that I did fall over at least once. Definitely need really good walking boots and poles on this one. The poles saved me on a number of occasions. Best avoided if really wet! Summary: A pleasant and leisurely activation. Whilst waiting for S2S opportunities aI was able to eat lunch and commenced the construction of the Mt Little Joe Cairn Project; inspired by a rock placed on top of a log near my operating position. Please feel free to add a rock or two if visiting! Click here for a Garmin Adventure on this activation.